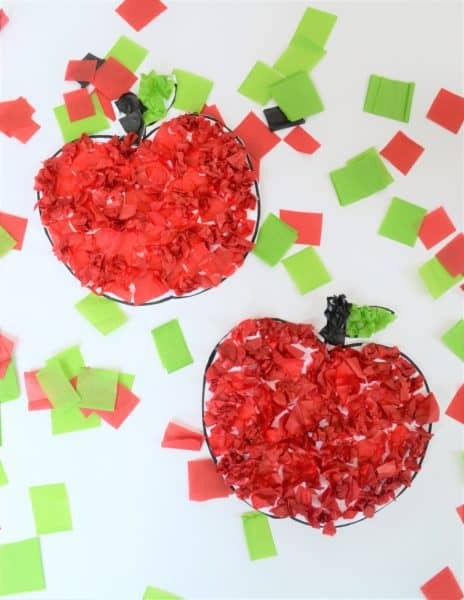 My kids had so much fun creating this easy tissue paper apple craft in honor of Back-to-School, and cleanup was a breeze with Wet Ones® Hand Wipes! Wet Ones®, America’s #1 Hand Wipe*, are the best way I know of to clean up messy hands AND kill 99.99% of germs in the process. Wet Ones® sent me some product for review, but we’ve been using them for years for quick and easy clean ups! 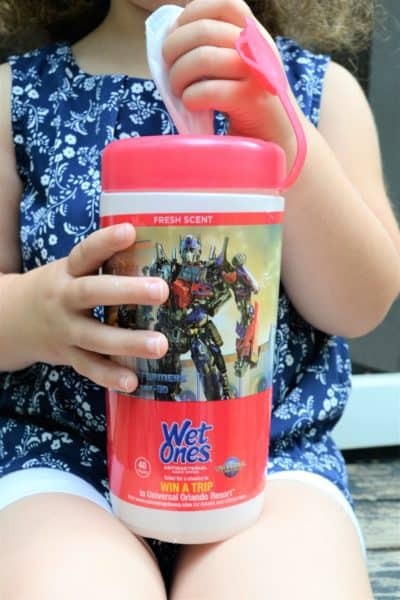 Available in canister and travel pack sizes, Wet Ones® are a convenient way to wipe up messes when water isn’t available, and I keep packs of them in my car, handbag, and around the house. You can find great savings on Wet Ones® with this Ibotta offer. 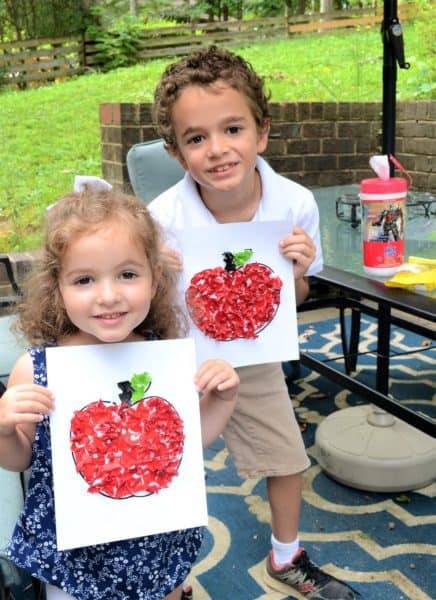 Simply print out your apple template (I printed mine on 8×10 cardstock), and cut your tissue paper into squares. 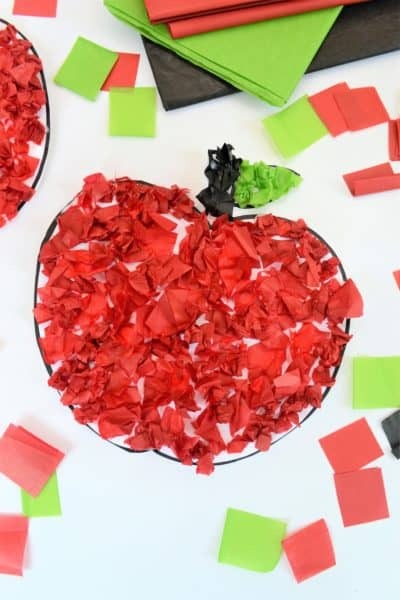 Wrapping a tissue paper square around the eraser-end of a pencil, dip into glue, and place on your apple. This was so, so easy, even my four-year-old could do it (and had a ball in the process)! Alternatively, you can skip the pencil and just ball up each square of tissue paper, dip it in the adhesive, and place on your apple. 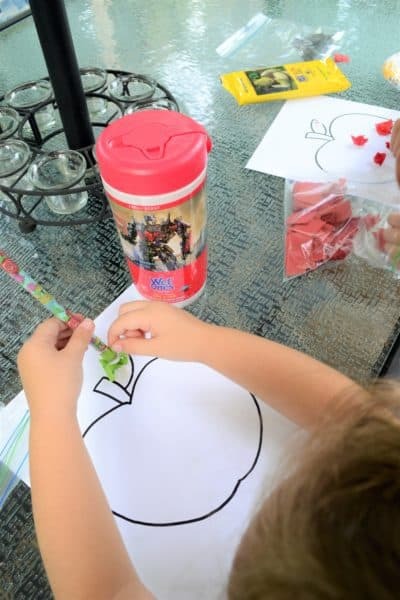 We used the red for the apple itself, the green for the leaf, and the brown for the stem. When you’re done, simply clean up with Wet Ones®, and you’re on your way! Best of all, these Specially Marked Wet Ones® Hand Wipes feature a sweepstakes for the chance to win a trip to Universal Orlando Resort™. 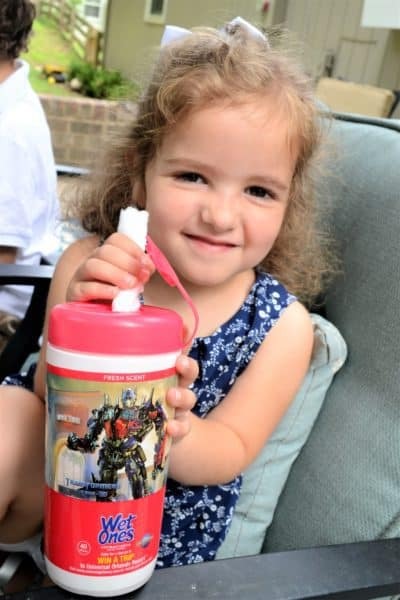 You can get them in 40-count canisters and 20 count travel packs with custom packaging based on two of Universal Orlando Resort’s hit attractions – Shrek 4D and Transformers™: The Ride-3D! No purchase necessary to enter, ends 11:59:59 AM ET 10/31/17 (50 US/DC). Must be 18+ to enter (19+ in AL & NE). Nice! What a lovely idea! Looking so nice! My kids would love to make that with me! This is adorable! Thanks for sharing at MyBusyBeehives BEE PARTY, I just wanted to let you know that you will be featured at tomorrow’s party! Have a great week! 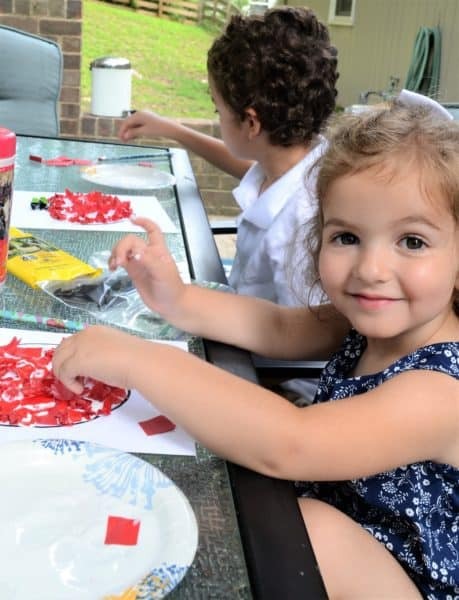 Such a fun craft to do with the kiddies! I miss those days terribly!! Will have to make these with my niece instead! Thank you so much for sharing your sweet project with us over at Waste Not Wednesday. Love this cute project! I used to have wet ones in my car all the time, when my son was little. They were a life saver! Thanks for sharing at Celebrate It!